When an obsession becomes a disorder. Jacqueline was a perfect child in the eyes of her parents, Ted and Nancy. Jacqueline had curly hair, blue eyes, a button nose and a great imagination. She seemed just like the other 7 year olds in her class. She enjoyed ice cream, was mesmerized by Disney movies and loved Chuck E. Cheese for birthday parties. However, Jacqueline’s parents noticed a gradual shift in their child’s thinking and behaviors. Her actions were increasingly affecting the family’s daily lives and became a cause for concern. One day when walking his daughter to school, Ted endeavored to make the stroll fun by playing a game. He encouraged Jacqueline to step over cracks in the sidewalk, warning that stepping on a crack would break mom’s back. The seemingly silly game turned calamitous as Jacqueline became worried when walking everywhere, taking care to avoid every single sidewalk crack. Soon Jacqueline was creating other rituals to neutralize the superstition. By engaging in other odd behaviors, such as counting the number of clouds in the sky or gray cars on the road, Jacqueline felt she was protecting her mother. In case Jacqueline unwittingly stepped on a crack, she believed, these other rituals would make the situation less risky. At first, Ted and Nancy thought it was merely imaginative play and a way for Jacqueline to express creativity. But, it didn’t stop there. Jacqueline developed nighttime rituals as well that revolved around fear of something happening to her parents. She would tap her parents on the head seven times each and check their bedroom doorknob to confirm it opened and locked easily. Jacqueline felt secure thinking her parents would then be safe if intruders broke in or disaster struck. Jacqueline also asked her parents to repeat certain sentences like “Jackie is our daughter, we love her very much, and nothing will happen to Jackie’s parents.” Ted and Nancy had to each repeat the phrase an even number of times. If they accidentally mentioned the number 13, their daughter wouldn’t go to sleep or attend school the following day. Jacqueline’s behaviors and rituals became an everyday occurrence. She no longer liked going to her 1st grade class or socializing with her friends. She had difficulty concentrating on program materials and would ask to go to the bathroom repeatedly to count all the cracked tiles. Jacqueline would also ask her teacher to call home to check that her stay-at-home mom was safe. Jacqueline had violent images of harm befalling her mother throughout class. Jacqueline refused to have her parents walk her to school for fear of stepping on a crack or harm afflicting her parents. She would have a crying outburst when the school bus arrived in front of her house. The family pediatrician and parents in the neighborhood considered Jacqueline’s behavior a normal phase that she would eventually outgrow. Jacqueline’s superstitious behaviors only escalated though and even after perfectly completing her daily and nighttime rituals, Jacqueline remained dissatisfied. She eventually stopped attending grade school altogether. Jackie’s young mind was consumed with violent images like her parents being bludgeoned to death and leaving her an orphan. Jacqueline envisioned that her dog Spot would be eaten by an alligator that crawled onto her parents’ Long Island property. Ted and Nancy could no longer utter certain words their daughter deemed bad words. Ted and Nancy were summoned by Jacqueline to only say what she believed to be good words like cloud, seven, play and fun. Jacqueline became a perfectionist. She would tear apart her coloring book if she colored outside the lines. She erased her penmanship with fervor when she didn’t find it neat enough. Jacqueline also prohibited her parents from inviting her friends to visit, worrying they might bring germs in the home that would kill the family. As Jacqueline’s 8th birthday approached, she wouldn’t allow her parents to throw her a party for fear of contamination from guests. The principal threatened expulsion because Jacqueline had been absent from school for nearly a month. When her parents explained the situation, the principal advised Ted and Nancy to take Jackie to a psychiatrist. They went online first to research Jacqueline’s symptoms, which indicated obsessive compulsive disorder (OCD). They discovered that this anxiety-based condition consists of pervasive thoughts and complex, ritualistic behaviors that serve to neutralize intrusive thought patterns. Ted and Nancy felt some relief that they were able to identify what was wrong with their child. However, what was the next step? A licensed psychologist trained in cognitive behavioral therapy (CBT) explained that Jacqueline met criteria for childhood onset of obsessive compulsive disorder. The psychologist explained OCD as a treatable anxiety-based disorder. He revealed that Jackie probably does not want to have these disturbing ideas. The thoughts come with uncomfortable feelings, such as disgust, doubt or fear if Jacqueline violates certain rituals. Or, they can be accompanied by a feeling that things must be done in a way deemed “just right” to Jackie. The psychologist said that people with OCD realize this is only a temporary solution. But without a better way to cope, they rely on the compulsion as a temporary escape. Compulsions can also include avoiding situations that trigger obsessions, like not leaving the house to avoid stepping on cracks. Ted asked why Jacqueline had OCD and whether it afflicted children as often as adults. The psychologist noted the recent trend toward an increase in childhood onset of OCD and spectrum disorders. About 30 to 40 percent of reported cases of OCD indicate childhood onset. Children with OCD generally possess above-normal intelligence and an active fantasy life. There can also be signs of rigid thinking or stubbornness. Both exist in Jackie’s case. There can be a sudden onset of symptoms, and having one or more parents or family members with the disorder makes a child more apt to develop OCD. Ted recalled that his mother washed the floors constantly and repainted the walls each time guests visited the home. There were probably genetic factors influencing Jacqueline’s OCD. The psychologist indicated that there is often a combination of obsessions and compulsions. Fear of contamination, as in Jackie’s fear of germs, is the most common obsession in children her age. And her perfectionism concerning coloring and writing are classic examples of perfectionism in children with OCD. OCD traits may appear as early as age 2 and last four or five years. Compulsive movements can appear too, such as repetitively entering rooms, exiting rooms, moving one’s head or touching, like how Jackie tapped her parents’ heads seven times nightly. As children grow older, they might adhere to repetitive patterns of behavior. These patterns might influence eating, washing and dressing. Children convert these patterns into rituals. If the period of compulsive behavior persists, OCD develops. The key is to break the pattern before it becomes deeply ingrained within the child’s repertoire of behaviors and maladaptive as in Jackie’s case. Once an intense pattern is established, parents should immediately seek professional advice if impairment in social, emotional, academic and other areas of living are observed. Early detection and intervention are crucial. Hopeful, Jackie’s parents are taking strides to help their daughter. 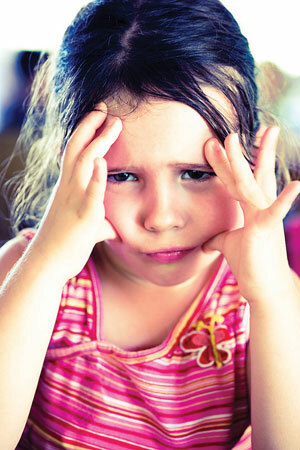 For additional information about obsessive compulsive disorder in children, log onto www.ocfoundation.org.